The last place that I visited during the Setouchi Triennale also happens to be the only place that is being held during the spring season only. The small island of Shamijima is only 0.28 square kilometres making it the smallest “island” of the entire Triennale, yet with 90 residents, it isn’t the smallest in terms of population. The term “island” is something that must be used in quotes as Shamijima is no longer technically an island. In 1967, Shamijima was connected to Shikoku with a land bridge and ever since, it couldn’t really be considered an island but it has retained its island name. Shamijima itself is a great place to visit as it is away from the city and a great getaway. The beaches are nice and you can escape from the main city. The only problem is that access is a little difficult with the surrounding area being more industrial than residential and the noise from the trains on the Seto Bridge was a bit annoying, but it was a great place with a great view of the busy Seto Inland Sea and the Seto Bridge. 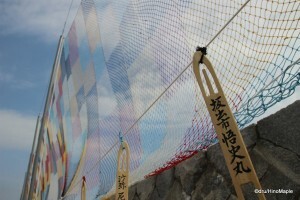 The main attraction in Shimijima is of course the art. With 5 locations, including a school, I originally didn’t think too much about this island but my appreciation for the art grew the longer I was there. I am sad to hear that many of the artworks will probably no longer be there after this spring but if you have a chance to see it, you won’t be disappointed and you won’t need a lot of time to see everything. The best way to get there is to just take a train from Takamatsu to Sakaide Station. While I thought I had to take the local only, I learned the hard way that the Marine Liner is not a special train and regular fares applied. I missed the first train so I took the local to get there. It was not a problem and I eventually got onto one of the buses to Shamijima. During the festival, there are special buses to and from Sakaide Station and the people working in the station were very helpful in getting me the information on when the buses run. Because I was really early, the entire area was relatively empty. I had a good amount of time to enjoy all of the artwork as well as not feel rushed in needing to see everything. Upon getting off the bus at Shamijima, the first thing to do is look for the big open park or all of the Setouchi Triennale flags and head that way. It is pretty easy to find the first artwork, “Stratums” by Tanya Preminger, as it is a big mound of dirt in a flat open park. When I visited Stratums, it was still mostly dirt but the grass seeds had been planted on the mound and a few blades of grass were starting to form. It may look like a simple mound of dirt with slopes reaching for the peak at the moment but it is an interesting mound that will hopefully be on the island for years to come. I read an interesting interview with Tanya on Ogijima’s blog. In fact, you can read about the preparations for Shamijima on the same blog which provides a lot of insight into how the various artworks were created on Shamijima. From Stratums, the next artwork you run into is “Sora-Ami: Knitting the Sky” by Yasuaki Igarashi. The work is simply a colourful net strung up along one of the beaches in front of a small beachside restaurant. 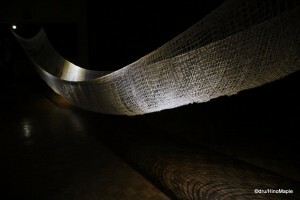 The artwork is very beautiful when the wind hits it as the net acts like a sail and billows towards land. 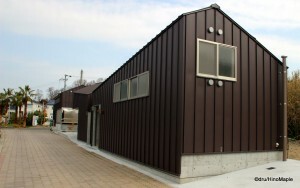 Next to Sora-Ami is the “Shamijima Nishinohama beach house”. It is a special purpose built building for the beach itself. It includes a washroom, a store house, and a small kitchen for selling food. During the event, they had an EAT&ART TARO event where you could buy “Island Soup”. Each season, on different islands, EAT&ART TARO works with the locals to create a special soup for festival goers. For spring, his shop is located on Shamijima, and in the summer he’ll be in Ibukijima. In autumn he will bring a final soup to Honjima to close out the festival. 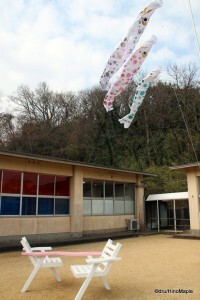 Moving on to the northern area of Shamijima, you will run into a school with beautiful carp wind socks flying in the courtyard. The school is the site with 4 different artworks and a small café. As you walk in, you are greeted by “From a nameless island” by Mitsuo Toyozaki in the hallway. 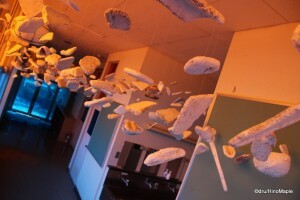 It is a striking contrast of blue and yellow-orange with Styrofoam hanging from the ceiling. It is a surreal experience that cannot be explained and pictures can’t do it justice either. The first room you encounter is the “Crystallized Salt Drops of sweat absorbed into sand on a beach” by Hana Sakuma. It is a stunning hammock like structure that fills a dark room with a couple spotlights trained on it. It was one of the most interesting pieces to photograph in the entire school. Next up is “KAISOU – shamijima” by Yukie Ohata. It is a type of etching using sea shells. 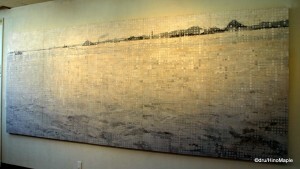 I’m not sure of the correct name for the technique but simply put, the artist painted a wall and then etched out the image of the coast from the viewpoint of the school itself. You are invited to see both the real and etched version of the coast together to see how they connect together. It was a spectacular piece of art and the fact she used sea shells was amazing. Lastly, but not least was “Shiro” by Kentaro Hayashi. 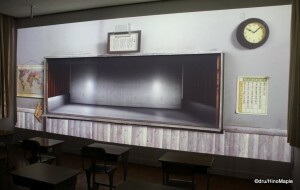 It was a simple classroom with a projection on one wall. It was reminiscent of the wall projections that are very popular in Japan these days. They did a special one for Tokyo Station where they projected a video to celebrate the completion of the Marunouchi Building, as well as another display in the winter for Christmas, which was quickly shut down due to its over popularity. Sapporo even had one for their Snow Festival this year. The video is a telling piece about the change of time within that classroom and how classrooms have changed over time. At least that is my own perspective into it. Outside of the school, in the courtyard and at the north beach was “Love Nine-legged race, LOVE” by Syuzo Fujimoto. There are 3 metal chairs that make up the entire work. In the school courtyard was the love seat, and a twin seat. Next to the beach was the Nine-legged race seat. It was an interesting place to just sit and watch the ships pass by with the Seto Bridge as the backdrop. It was really peaceful and most enjoyable because it was a weekday and I could almost enjoy the entire view to myself. After I finished visiting the art installations, I still had about 40 minutes before my bus departed. I decided to head to the Seto Ohashi Memorial Park. 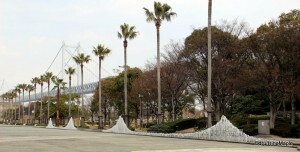 It is a large park with a long fountain running through the centre of the park. The fountain itself is designed to look like the bridges that make up the Seto Ohashi network as well as provide a place to play for children. The park itself was not very interesting but there were a lot of play areas for kids, a small museum, and a small garden and amphitheatre. I was surprised at the size of the park but given the proximity to the Seto Bridge, I can understand why they placed it there. It was still pretty busy for a weekday morning and I was a little surprised by how many people were there. It felt as if it could have been overrun by homeless people, especially if it was in Tokyo. I did enjoy it and if you have the time, do try to check it out. You never know what you will find if you are walking around there. My overall impression of Shamijima was very good. I didn’t have as much time as I would have liked, but any more and it might have been too much. Like any art island in the festival, the earlier you go the less people will be there. I think a lot of people are expecting to go in the late morning and then explore things at a leisurely pace. My guidebook said it would take 2-3 hours to explore, but they don’t necessarily include the time it takes to eat or take hundreds of photos. There is a lot to explore on the island itself and I do encourage you to take a look around. It isn’t a big island but there are always little surprises to be had. 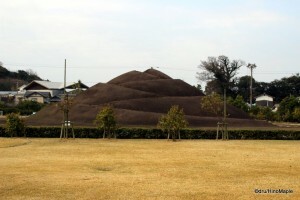 Shamijima is part of a series of posts on the Setouchi Triennale. 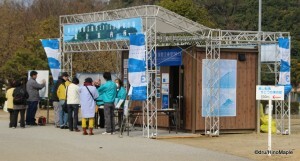 Follow the links below to read more about the different aspects of the Setouchi Triennale. 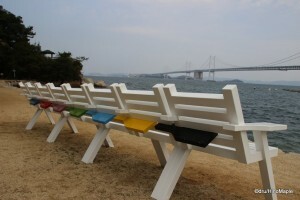 This entry was posted in Setouchi Triennale, Shikoku and tagged art, japan, Sakaide, Seto, Seto Inland Sea, Seto Ohashi, Seto Ohashi Memorial Park, Seto Sea, Setouchi, Setouchi Art Festival, Setouchi Triennale, Shamijima, Shikoku, Takamatsu by Dru. Bookmark the permalink. Also note that the asteroids are styrofoam collected from the nearby seas. At least that’s what I heard.